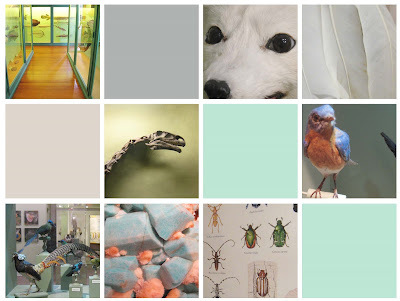 A couple of months ago I took a little trip to the Harvard Museum of Natural History. It's free on Sunday mornings for Massachusetts residents...so I decided to take advantage and I sure am glad I did! I've always found inspiration in nature and growing up on a dairy farm surrounded by woods and fields and ponds and streams...there was plenty of nature to be found. Since moving to Boston 3 and a half years ago from upstate New York...I found nature wasn't at an arms reach anymore. People, restaurants, stores, office buildings and culture took it's place. Little did I know however that a wealth of natural inspiration was in fact at my finger tips. There was more variety and things were even closer up than I had experienced growing up. It was all at the Museum! Room after room after room displayed rocks and historical artifacts and taxidermy animals from every continent! It really was stunning to see the different examples of what nature had to offer. The only thing that was missing was the natural habitat and living, moving creatures. If you're a Massachusetts resident, admission to the museum is free from 9-12 on Sundays. Go check it out and get inspired and educated! 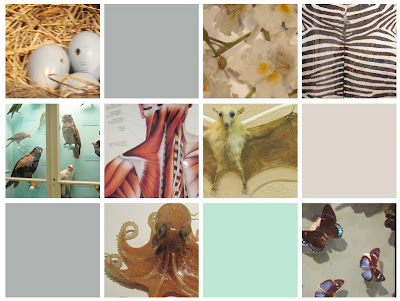 The first time I visited the museum I was stunned with the amount of natural history on hand. It is really worth the trip if you haven't been! My favorite items are all the rocks and minerals. - We took a trip once with the museum to a mine in New Hampshire and learned more about minerals, and even went down in an old mine! Thanks for the tip about the free Saturday mornings...I'll have to go back!